Safe side entry step assures maximum use of the 94” fitness space in a compact 12’ length. 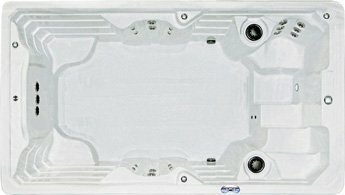 Dual RX6™ massage columns and 18 hydrotherapy jets complete this popular fitness spa. Two body hugging massage seats with 24 hydrotherapy jets compliment your aquatic wellness routine for a fitness spa that promotes a healthier lifestyle, mind and body. The SL15s measures a full 15’ long with a spacious 130” for aquatic fitness routines. Three Synergy Pro™ Jets offer ample resistance for health and wellness only a quality fitness spa can deliver. 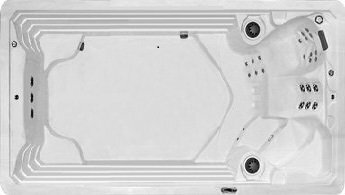 Adjustable, powerful water resistance makes aquatic fitness goals attainable, simply and pleasurable in this 15’ fitness spa model. Roomy fitness lane and curvy massage seats soothe from head to toes for total body wellness.